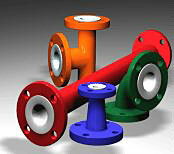 PFA/FEP lined Flush bottom or bottom flush or bottom discharge valves are used to flush tanks and are mounted on bottom. PFA/FEP lining renders it corrosion resistance. C.I. Graded Casting, W.C.B. Or S.S.